When the entirety of Florida’s Everglades were overrun by the nonindigenous red-lipped tree frog, conservationists knew that they needed to take decisive action. The resilient amphibians faced no predators in the region, and they were wreaking havoc on the area’s natural balance. But then, a team of scientists had a brilliant idea to save the swamp by introducing Green Bay Packers into the ecosystem. 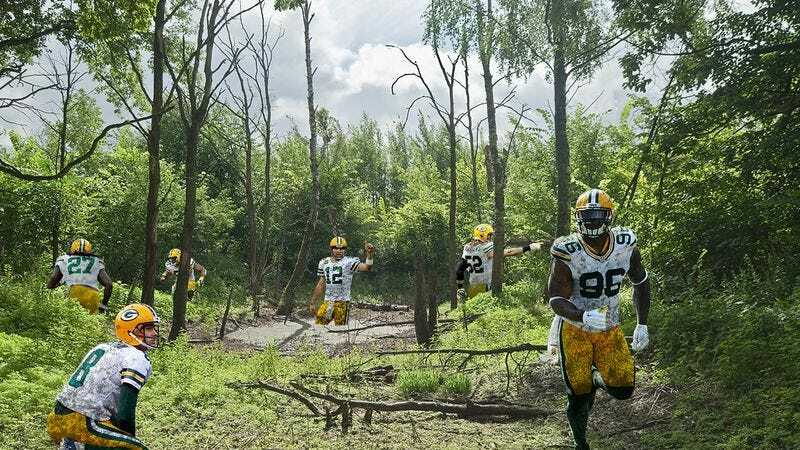 In only a matter of weeks, the Green Bay Packers’ proclivity to hunt and kill the tree frogs restored the swamp’s fragile ecological network to comfortable sustainability. Their size and strength lends them a natural advantage in preying upon the non-native frogs! Researchers say that the Green Bay Packers have practically eliminated all the red-lipped tree frogs and brought much-needed stability to the delicate marshes. And as a bonus? The Everglades’ mangrove forests are now full of Packers! Perfect! With the Everglades’ bogs and cypress tree copses now inhabited by a flourishing population of Green Bay Packers, there won’t be any red-lipped tree frogs in the wetlands for a long time to come! Thank goodness for these preservationists’ quick thinking!